Firsts are always exciting, from your first love to your first job. While your very first cruise is also an exciting event, for those new to cruising your first ocean voyage can also come with a bit of anxiety from not knowing what to expect when you first arrive at the cruise port to when you're welcomed aboard. Our friendly and knowledgable CruiseInsider experts are behind you every step of your journey and are always there to answer your questions, ease your trepidations and ensure you're prepared to board your ocean liner. To help you set sail smoothly, we've compiled insight and information from actual experts so you can begin your cruise vacation with confidence knowing exactly what to expect when you board the cruise ship. While there are some similarities to air travel, boarding a cruise ship is generally a lot less stressful and far simpler for the average traveler. Depending on the cruise line, size of the ship/number of passengers, and how efficient the boarding process is, embarkation can range from 30 minutes to a few hours. If you’re flying into the port city, plan to arrive at least a day early in case of flight delays that could cause you to miss your ship. Many luxury cruise lines include transfers from the airport or your hotel directly to your ship as part of the fare, which means there's no need to rent a car or pay for a cab. If you’re driving to your embarkation location, add plenty of extra time for unexpected delays like traffic and be sure that you find out about parking in advance. Some cruises even include port parking, so you won’t have to worry about long-term lot fees and, like airports, can leave your car there safely until you return. Cruise terminals are comfortable, but don't expect the same amenities as you'd find in an airport. While boarding times and procedures can vary significantly depending on cruise ship, your stateroom category, or your status with that cruise line, but boarding typically begins in the late morning and continues until about an hour or so before departure. You’ll be given a window of time in which you can begin boarding the ship, as some cruisers like to maximize their time on land before boarding while others like to be the first onboard to eat, explore or enjoy the pre-cruise festivities. Arrive too soon and you may have to wait in the cruise terminal until your group is cleared to board. While most cruise terminals are pretty sparse in terms of amenities, it's better to arrive early and plan in advance. If you get there after check-in has ended – even if it’s only a few minutes late – there’s a good chance you won’t be able to board the cruise ship at all. Insider Tip: It may be a quicker check-in process toward the end of the boarding window after most passengers have already boarded, but don't cut it too close! Your boarding documents, which will either be mailed to you in advance or printed at home. Your luggage tags. Sent by the cruise line or printed by you at home, they are usually color coded and correspond to your stateroom. Passport and/or driver’s license, depending on your particular cruise. A credit card. Cruise ships are "cashless societies" that require a valid credit card for onboard purchases, so don't forget your form of payment. 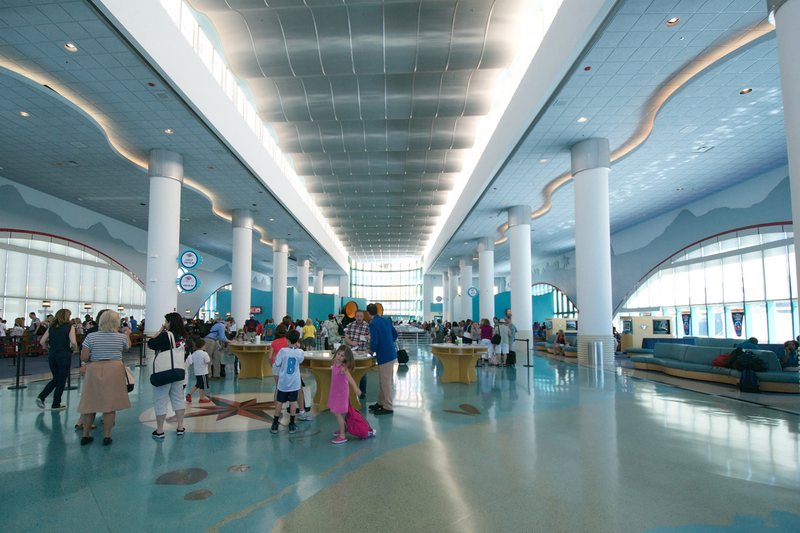 When you reach the cruise terminal, you’ll be welcomed by baggage porters. They’ll tag your bags if you haven’t done so already. Most cruise line provide the luggage tags as part of your cruise documents, and you'll want to attach them yourself before you get to the port. Once checked, the porters will bring your bags onboard and the cruise line will deliver them directly to your cabin later that day. Since your bags may show up at your cabin after you do, it’s important to put anything you might need for that first day such as prescription medications, a bathing suit, change of clothes and boarding documents, in a small carry-on or backpack that can stay with you. 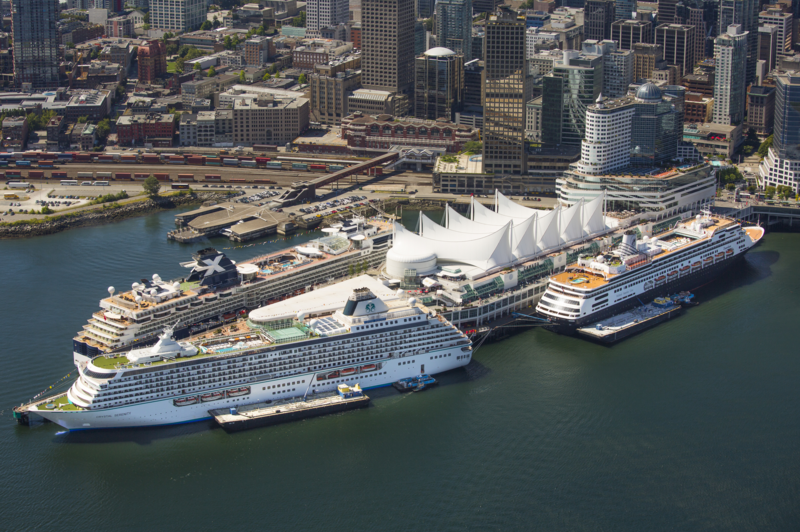 Vancouver's cruise ship terminal is one of the most popular in the world. Similar to the airport, you and your carry-ons (and your luggage) will be scanned and have to go through a security checkpoint, but the process isn’t as rigorous. Further inspection usually isn’t required unless security finds something that is prohibited. Unlike airports however, you won't have to remove your shoes or laptops and such. There is also no “3-1-1” rule that requires liquids to be less than three ounces or to be placed inside of a clear bag. There are many prohibited items you can't bring on board including weapons, drugs, alcohol or flammable items, but for a smooth security experience, it’s best to also avoid questionable objects like scissors, pepper spray or anything that could spark a fire other than lighters – none of which are allowed on a cruise ship. After dropping off your luggage and going through security, you’ll need to fill out a form that states whether anyone in your party has been ill recently. Preventing the spread of germs is paramount aboard every cruise ship and no one is going to send you home if you cough or sneeze in the check-in line, but as a matter of course, all cruise lines require passengers to answer the questionnaire which asks if you’ve been sick or are experiencing any symptoms of illness over the past week. Insider Tip: We don't recommend cruising at all if you're experiencing any serious or contagious sicknesses or gastrointestinal illnesses – vomiting, diarrhea, nausea. Not only will you be miserable onboard or spread that to others, it also means you could be denied boarding altogether. After you've checked in and cleared the first checkpoint, your picture will be taken for security purposes and you’ll be given a cruise card which serves as your ship's ID, your room key, boarding card and onboard credit card. Then you'll head towards the ship. On your way there, photographers will be on hand asking you to pose for a picture. These photos will be available to buy onboard later, but there's no obligation to pose for this photo-op or to purchase anything, so we recommend capturing this fun memory of your first-ever cruise! Gangways connect a main deck of the ship directly to the cruise terminal. You'll then follow an elevated ramp called a gangway right to the ship. A member of the ship's security crew will typically check you in via your newly issued cruise card. As you enter the ship, typically near the main atrium, there will be excitement in the form of smiling staff, live music, champagne or cocktails, finger foods or other fun activities. Now, your first cruise experience has officially begun! Time to enjoy the welcome celebration, start exploring the ship on your own or head off your cabin to unpack or unwind once your category has been "cleared". If you have any worries or concerns about boarding a cruise ship for the first time that we didn’t address here, please contact our CruiseInsider experts at 1 (877) 734-6858 to learn more.